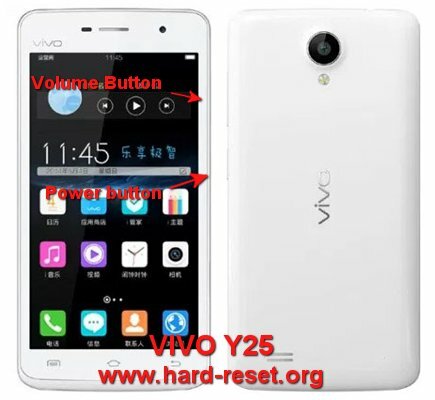 How to Easily Master Format VIVO Y25 with Safety Hard Reset? This is smaller size screen at 4.5 inches width, using Android Lollipop and have internal memory 16 GB using 1 GB RAM. This cheap smartphone are sufficient for entry level smartphone users who do not care about specifications. However, we still can run several important applications with this internal memory and some multitasking RAM. VIVO Y25 is dual simcard smartphone which can standby together. The community of www.hard-reset.org will give more information about how to solve problems at VIVO Y25. The VIVO Y25 will do the hard reset or master format to factory default process. How to Unlock or Fix or Bypass or Solutions for VIVO Y25 forgot password code or security lock screen pattern or pin (lost password)? Starter user of Android will enough to use VIVO Y25 because the price is cheap but with limited features. However, we still can take private pictures with 5 megapixel main camera and 2 megapixel front camera. It is better to always give security protections to secure our data from unauthorized people or when this phone stolen or lost. VIVO Y25 does not have fingerprint sensor. We can use screen lock pattern or password pin protections. The problems will be happen when we forgot security answer, what should we do? Do not worry because we can unlock or bypass forgotten screen lock pattern or password pin protections at VIVO Y25 use registered Google account. Please turn ON our phone, when it ask for security answer, then we can try to give several time wrong answer continuously until our VIVO Y25 freezing or locked 30 seconds, at this time we can find Forgot Password / Pattern button, press this button to unlock using Gmail account that we have already sign-in before. If we can not access our Google account, then we have to do hard reset using hardware button combination key. Is That Any Secret Code for Doing Format VIVO Y25 ? There is no secret hidden code for VIVO Y25 to make it back to factory default. Do the options above to hard reset it. How to Format or Erase Phone Memory at VIVO Y25 ? There are two phone memory type at VIVO Y25, one is internal memory and the other one is external memory. If we want to format internal memory phone then we have to do hard reset or reformat the operating system of VIVO Y25 as well. Please use menu setting to do hard reset or reformat using #option 1 above, but make sure to give checkbox mark at Erase Internal SD card / Internal storage. Then it will reformat the factory default operating system and remove or erase any data inside internal memory. Having external memory is important when we need to have more storage capacity, but all installed applications will use internal memory to keep applications files. Therefore external memory important to save music or movie or photos. How to Make Battery of VIVO Y25 Stronger, Life Longer and Not Fast to Drain? This phone does not have big battery because it have 1900 mAh battery capacity. But some entry level users, having 4.5 inches LCD screen smartphone will enough to run for one day. If we need VIVO Y25 battery work more longer, then we have to do some adjustment like make LCD screen brightness as low as possible, because more brightness we use LCD then the battery will consume more power. Please disable all not use connections at this phone like GPS or Bluetooth or Wifi. We can activate GPS battery saving mode from menu Setting > Locations if some applications as to know our locations. The information from this page describe about All vivo mobile ha. If you need another resource for hard reset, use search function at this homepage or find from our related posts. How to Easily Master Format ONEPLUS 3T with Safety Hard Reset? How to Easily Master Format GOOGLE PIXEL 3 (XL) with Safety Hard Reset? How to Easily Hard Reset LG G4 / G4 DUAL (H815 / H815T / H815P / H811 / H818N) with Safety Master Format?